Jim Quinn had an eventful bicycle ride in August. While riding near his home, he fell. A passing motorist called 911 and Quinn’s wife. North Caldwell police arrived quickly, Quinn said. “I was in pain but lucid and declined their suggestion for an ambulance,” he said. His wife arrived on the scene and was prepared to drive him to Mountainside Hospital in Montclair, which was about 5 miles away. But police called for an ambulance and insisted it take him to St. Joseph’s Regional Medical Center in Paterson, more than 10 miles away. The township ambulance was unavailable, Quinn said, so a third-party ambulance company arrived. It transported Quinn to St. Joseph’s. Quinn said he was thoroughly and quickly examined at the hospital, with two residents in charge of his care. He was diagnosed with a broken left wrist and a broken right clavicle. The clavicle didn’t need treatment, but the residents said they would set Quinn’s wrist and release him once they got the okay from the physician, Quinn said. The treatment was completed and Quinn was released that afternoon. When the explanation of benefits statements came in from his insurance company, UnitedHealthcare (UHC), Quinn was shocked by the cost of his care, he said. There were several charges: a hospital charge for $7,349, two ambulance charges totaling $3,745, and a $15,833 charge for the orthopedist with another $1,500 for related services. The total cost was nearly $30,000. Almost all of the bills were covered by Quinn’s insurance. He said he received extensive attention when he first arrived – that was the $7,349 hospital charge. But the nearly $16,000 charge for the orthopedist, he said, seemed excessive for what amounted to a splint on a broken wrist applied by the two residents. UHC paid, actually sending Quinn a check to remit to the provider because it was an out-of-network doctor. Quinn looked more closely at the bills. He said he called the orthopedic practice to ask about the charge, and he was told it was for the doctor consulting at the hospital. But Quinn never saw the doctor in the emergency room, he said he told the rep. He was told again the charge was correct. The rep said Quinn could challenge the payment in an appeal. So he did, and he informed the orthopedic group and the ambulance company he was disputing the charges. But his correspondence would be directed to the correct — but unnamed — department, the letter said, and he would receive a response from them. He asked Bamboozled to look more closely. We reviewed Quinn’s bills, insurance statements and timeline of events. Quinn was right to question the charges, patient advocates said. Studies show nearly half of hospital bills have errors, said Caitlin Donovan of the National Patient Advocate Foundation. A recent study by New Jersey Policy Perspective found surprise out-of-network bills cost 168,000 consumers an average of $2,500 a year. Donovan said Quinn could have refused the ambulance and as long as the paramedics didn’t work on him, he wouldn’t have been charged. “Otherwise, that seems like the horrific medical equivalent of ordering 20 pizzas to your neighbor’s house,” she said. Doctors want lawmakers to require hospitals, doctors and insurance companies to fully disclose out-of-network prices but stay out of price-setting. Cynthia Lucas, senior director of anti-fraud initiatives for the National Health Care Anti-Fraud Association, saw something unusual with the ambulance bills. The ambulance company charged $850 for basic life support, or BLS, on one claim. The second claim charged $2,395 for advanced life support, or ALS. “Advanced life support seems excessive for a broken wrist,” Lucas said, noting the definition of ALS from Johns Hopkins: “continuous IV medicine,” “any patient on a cardiac monitor,” “patients with potential airway compromise,” obstetrical patients or those from urgent care centers. Quinn said he thinks he was on a morphine drip but he wasn’t sure. 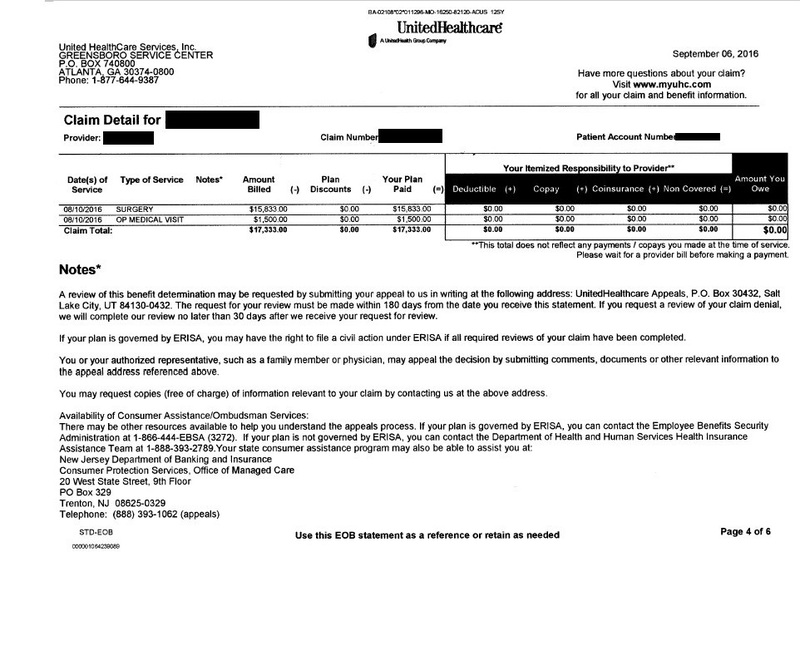 Both bills had the same $250 charge for mileage, but alas, Quinn’s wife drove him home from the hospital. Quinn said he couldn’t find the Current Procedural Technology code, or CPT code, for his “surgery” charge on the statements. Different codes for treatment, and the different prices for each, can be confusing. One study Donovan cited found wide disparities in charges at different facilities for the same procedure. Another study sponsored by the National Institutes of Health found emergency room charges for a sprain ranged from $4 to $24,110. That’s not a typo. “This type of unpredictability undoubtedly has an extreme, adverse effect on both patients and the entire health system,” Donovan said. Lucas said not all surgical codes include the actual cutting into the patient. “Some surgical codes describe procedures, such as resetting/casting a broken wrist,” she said. Eight in 10 medical bills involve errors that can be costly to patients, according to the Medical Billing Advocates of America. Lucas reached out to UHC’s special investigations unit on Quinn’s behalf. It said it is still looking at the ambulance charges. So it’s now six months since Quinn’s accident, and Quinn still doesn’t have a resolution. With the delays, he had to take action to avoid collections. He deposited the $17,333 insurance check for the orthopedist and related services in a separate account for safekeeping while waiting for an answer. In late January, he sent the orthopedist $3,000 to stop collection threats, he said. Also in late January, Quinn paid the $600 and $264.50 he owed for the two separate ambulance charges. His out-of-pocket costs for the emergency room totaled $150. And he’s still waiting for an answer from UHC. The Patient Advocate Foundation provides free case management services to patients with chronic, debilitating conditions. Other patients can find help through Medical Billing Advocates of America at (855) 203-7058. You can also get help with Medicare claims from the Senior Medicare Patrol at (877) SMP-4359. 1. Contact your insurer. Ask about possible mistakes and how to resolve the issue. 2. Contact your provider. If it’s a legal and legitimate charge, negotiate based on the Medicare rate or ask for a payment plan. 3. Stay updated on state laws. New Jersey legislators are fighting over bills to stop surprise medical bills. 4. Get everything in writing. You will need to back up all your claims and make sure your bill doesn’t go to collections. 5. Be patient. Disputing a bill can be a long process. Donovan said she only recently resolved one that took over a year. Donovan said we need a system with greater transparency and with better consumer protections against surprise medical bills. We’ll keep you posted on Quinn’s case.